Nearly every spinner we sell comes in an symmetrical design, which is probably why this beautiful new 84" Circle Flowers w/Mirrors Wind Spinner stopped us dead in our tracks with awe. Alluring and enticing with colorful circular patterns and offset metal and mirrors design; this tall wind spinner had motion, and creates the feelings of perpetual motion and potential energy. 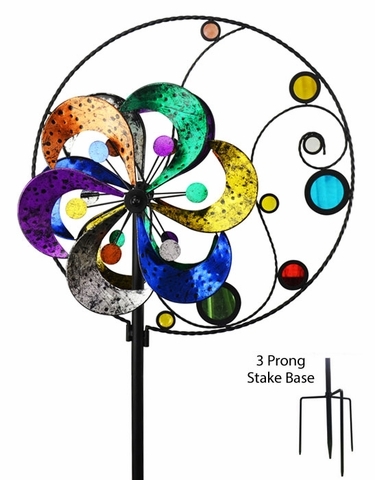 A simple classic wind spinner infused within a modern design, this beautiful metal wind spinner will look amazing in any home garden landscape! If you need an impressively tall garden stake with color and motion grace this garden accent is simply wonderful. Size: 84" Tall, 24" Wide, all Metal. Alluring asymmetrical wind capture design. Thick poles & Triple Prong ground fork.